Since 1972, Soroptimist International has been helping women the world over reclaim their dreams through the Live Your Dream Award (formerly Women’s Opportunity program). The Live Your Dream Award is a grant awarded to female heads of households who need additional skills, training and education to enable them to upgrade their employment status to re-enter the workforce so they can provide adequately for themselves and their families. The Soroptimist Ruby (formerly Making a Difference for Women) Award acknowledges women who are working to improve the lives of women and girls through their personal or professional activities. 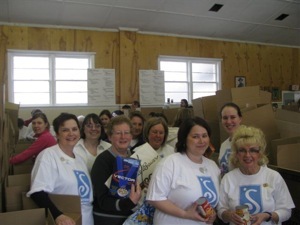 Their efforts help to promote the issues that are important to the Soroptimist organization. Honorees are women who have worked in extraordinary ways to benefit women and girls. Examples of the type of work honored include: spearheading an effort to open a domestic violence shelter, working to secure health services for low-income women, starting a mentoring program for at-risk girls, or lobbing companies to provide on-site child care. For information about nominating a woman in our community for the Soroptimist Ruby Award, please contact soroptimistdaf@gmail.com. This project takes international best practice and evidence and applies it to the local situation in Papua New Guinea – increasing access to both skilled birth attendants and functioning health care services. We provide funding for the local food drives (Dundas, Ancaster and Flamborough), as well as participating in the hands on sorting of donations at the Ancaster Food Drive each February. Additionally, we prepare Christmas Hampers for families in need, comprising food and gifts, through the Salvation Army and Hamilton Basketeers. We provided $20,000 in financial support to the YWCA of Hamilton Encore Program. Encoreis a FREE exercise program designed specifically for women who have experienced mastectomy, lumpectomy or breast reconstruction surgery at any time in their lives. Based around floor and pool exercises and relaxation techniques, the program is safe, fun, and therapeutic. YWCA Encore is more than an exercise program; it is a supportive environment where women are able to share their experiences, concerns, and feelings with other women who will understand. Community Garden in AncasterIn 2007, we planted and maintain a garden at the Ancaster Community Cetre in memory of our late Soroptimist sister, Alma Hodges. The garden is maintained by Crimson Leaf Landscaping and watered/weeded by the women of SI-DAF. This unique program offers street-involved or homeless youth (ranging in age from 16-21 years) access to safe, affordable, one-year housing with on-site support programs to aid the youth in building the skills necessary to reach their ultimate goal. Our club sponsored day to day ‘luxuries’, that the majority of us would take for granted. For example – bus tickets, grocery store vouchers, Christmas gifts by way of a Shopping Mall voucher, and paper/ink supplies for the computer we purchased last year. We also held a cooking demonstration and a workshop to help with resume writing and career exploration. Drummond House provides a transitional home for women and children who are in need of temporary accommodation. Under the leadership of Debra Tigchelaar, who had a vision to have a “home” for women and their children during a time of distress, our club has sponsored a Room with a View. This program assists with the repair, maintenance and furnishings for one bedroom as well as bedding and bath supplies, new blinds and window coverings, and a baby crib, monitor, children’s bedding needs.